Self serve taco bars are an easy way to entertain a crowd. 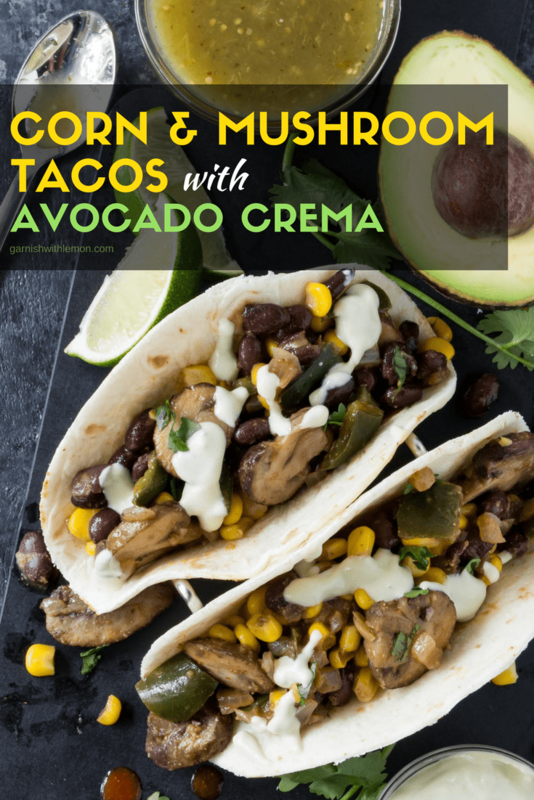 Add a meatless option to your taco spread with these Corn and Mushroom Tacos with Avocado Crema! Who doesn’t love Taco Tuesday? Tacos are always crowd pleasers and taco bars are a convenient way to serve a large group of people. 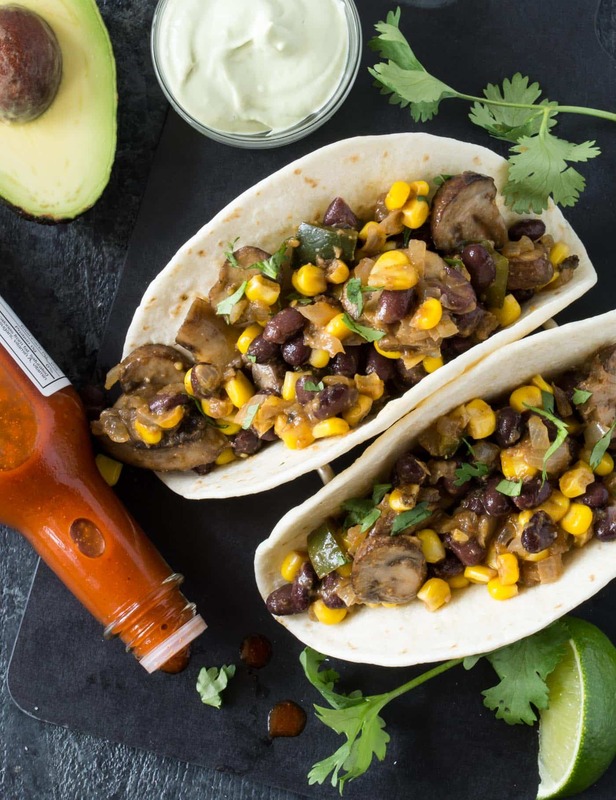 We’ll never turn down a good meat and cheese taco, but adding these hearty and flavorful Corn and Mushroom Tacos with Avocado Crema to our taco bar is a delicious way to add some veggies to the spread as well as please any non-meat eating guests. You’ll find all the flavors of a regularly seasoned taco here – cumin, oregano, chili powder, garlic and onion – with a few surprises. A mild heat comes from the poblano pepper and bit of hot sauce, while the fresh lime juice and cilantro keep the taste bright. I like to top these Corn and Mushroom Tacos with a dollop of cooling avocado crema, which is just a fancy way of whipping together some avocado, sour cream and lime juice, but feel free to keep your avocado and/or sour cream separate and garnish with whatever makes you happy. Tip: Is your avocado crema too thick? Add a bit more lime juice to loosen the consistency. 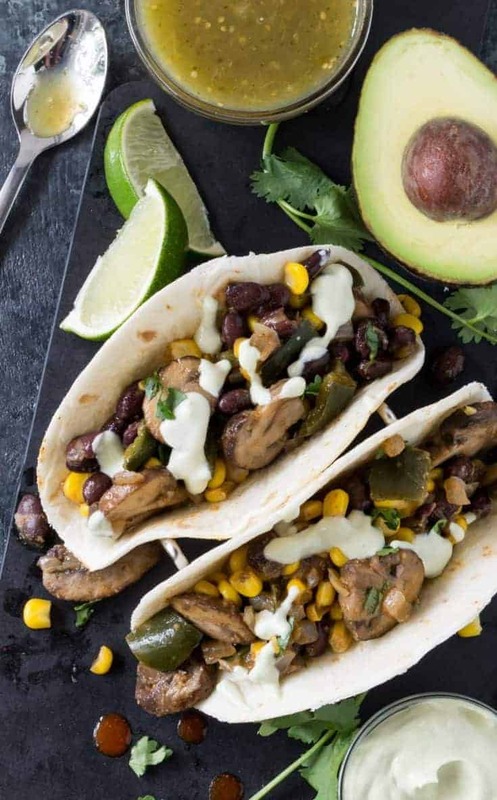 Try these Corn and Mushroom Tacos with Avocado Crema at your next Taco Tuesday. You’ll be surprised at how tasty they are, plus they are similar enough in flavor to classic tacos – sans meat – to give even “taco purists” reason to branch out and try something new. I love using this tortilla warmer when we have a big taco buffet. It helps keep the tortillas warm and pliable whether you are the first or last guest through the buffet line. This is one of the few cutting boards I’ve used that doesn’t immediately dull my knives. Plus I love the back story of how they are made from recycled materials. Can every day be Taco Tuesday? We’d eat all these taco recipes!! Heat 1 tablespoon oil in a large skillet over medium heat. Add mushrooms to the pan and cook for 5 minutes, stirring occasionally. Add remaining tablespoon of oil to the pan. Stir in onions, oregano, garlic, chili powder, cumin and poblano pepper and cook for another 5 minutes, stirring occasionally. Add corn and beans to the skillet and cook for 5 minutes, stirring occasionally. Remove pan from heat and stir in salsa, 1 tablespoon lime juice and hot sauce. Season to taste with salt. Place avocado, sour cream and remaining lime juice in a blender and blend until smooth. If avocado cream is too thick, add additional lime juice to reach desired consistency. Season to taste with salt. Warm tortillas according to package directions. Spoon mushroom mixture into tortillas, garnish with avocado cream and chopped cilantro. Serve. I love these tacos for meatless Monday! I am going to save this recipe for later. Printing the recipe now. Looks great. Those are perfect for your family! Not to mention tasty too! I’m definitely one of those “taco purists” but have been branching out lately and getting more and more adventurous. I love the flavours in this recipe and will certainly give it a try! I hope you’re a convert, too! Thanks for stopping by, Shannon! This was restaurant-quality delicious! Just put chopped avocado on the taco instead of making the sauce with sour cream (for the hungry vegans I live with), but still turned out great. Fantastic, Haley! So glad you stopped back to let us know how it turned out for you.